Bashed and battered by impacts, and wearing a generous mantle of dust, Arabia Terra shows one of the oldest surfaces on Mars. This makes it great for exploring the Red Planet's past. And to dig into geo-history, a good place to start is a pile of debris left by earlier climate periods. Becquerel's mound measures about 50 km (30 mi) long by 25 km (15 mi) wide — roughly the size of southern California's Salton Sea — and it forms a low, flat dome that rises some 1,000 meters (3,300 feet) above the ground. That's a big pile of material. As with White Rock, scientists think the Becquerel mound is the remnant of a much larger blanket of sediments that likely filled the crater — and perhaps much territory beyond, as witnessed by drifts and piles of sediments throughout Arabia. If this is what happened, it suggests that the Martian climate first deposited an enormous amount of sediments over a huge area: Arabia Terra is comparable in area to the continental United States. Second, it suggests the Martian climate then flipped in some radical fashion so as to erode a great deal of what it had deposited earlier. The "why" is an unsolved puzzle. The mosaic image above comes from the Thermal Emission Imaging System (THEMIS), a multi-band visible and infrared camera on NASA's Mars Odyssey orbiter. The mosaic, in which the smallest details are 18 meters (59 feet) wide, shows the mound at visible wavelengths. Other spacecraft studying the Becquerel mound include the HiRISE and CTX cameras and the CRISM infrared spectrometer on NASA's Mars Reconnaissance Orbiter. On the mound's northern side, a giant staircase of exposed layers — each only a few meters (yards) thick — implies a long series of events built the mound from hundreds or thousands of sheets of sediments. A glance shows the layers are not all identical — besides varying somewhat in thickness, some appear to have been reinforced or augmented at semi-rhythmical intervals. 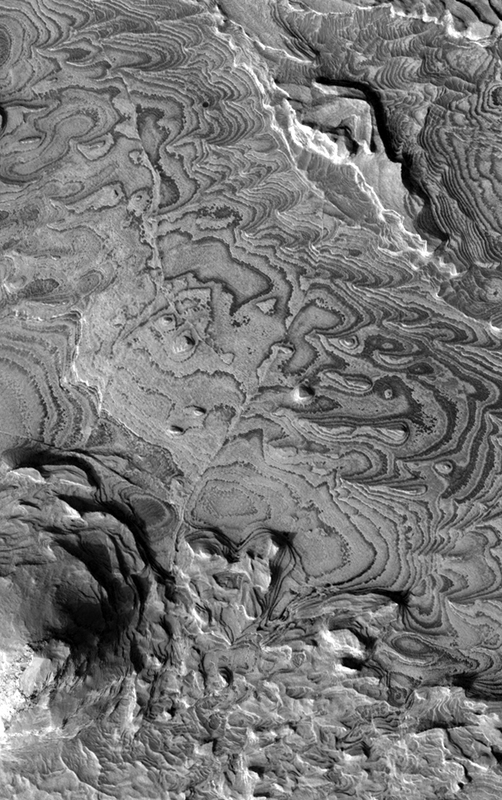 Similar patterns also appear in the layers that make up Mars' northern and southern polar ice caps. When Mars scientists seek to explain widespread patterns like this, they start by assuming that such changes have global origins. Computer simulations reveal that Mars experiences rhythmical variations in both the shape of its orbit and the orientation of its axis with respect to the Sun. The axial tilt, for example, varies over a period of about 120,000 years and becomes more enhanced every 10 cycles, or 1.2 million years. These changes force large and cyclical changes in the Martian climate. While the computer calculations become chaotic and unreliable over long periods, they point to Martian ice ages waxing and waning many times during the last 20 million years at least. This leads scientists to expect to find fingerprints from these changes written into the deposition and erosion of ice, dust, and other sediments. Still, some caution is in order. Recent examination of high-resolution images of the northern polar cap layers failed to match up the patterns in the polar layers with the predicted changes. This may be because the true cause of the layering has yet to be found, or that the linkage between the orbital forcing and the deposition of layers is more complex than previously thought. On top of the mound, the generally flat-lying sediments have eroded into mesas and tablelands, plus one outstanding butte. Much of the mound top looks like a sheet of weathered plywood. It's tempting to imagine what a rover explorer like the Mars Science Laboratory could do in this terrain. While the layers might simply be one sheet of homogenous wind-blown dust piled upon another, it's more likely that each layer contains geological signatures characterizing the Martian conditions when it formed. From terrestrial fieldwork, geologists know that many sedimentary secrets lie in the small-scale textures and details — a perfect task for a rover's close-up camera and other instruments to explore. 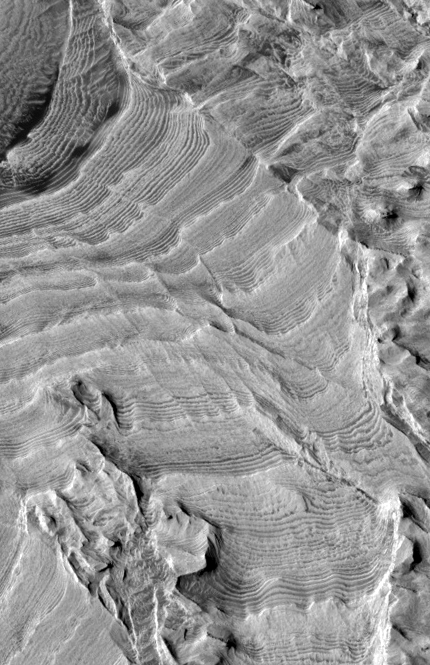 These details might include ripples that tell how strongly the wind blew in ancient times, or perhaps crisscrossing beds of debris that point to shifting wind directions. Where layers appear tougher and less easily eroded, some process (likely involving water) cemented the material, either as it was deposited or before the next layer began to accumulate. Mineralogical instruments could tease out details of how the changing climate altered these materials. On the mound's southern side a different texture has emerged. Winds carved the mound's sediments to produce lines of ridges running closely parallel. Geologists call these ridges yardangs (after their Turkish name). They occur in arid areas on Earth where winds have a chance to attack fine-grain material that's loosely compacted. The close-up view shows an impact crater emerging as the edge of the mound erodes and retreats. There's even a hint of the wind being deflected by the crater rim — notice how the yardang ridges change size and direction where they lie nearest to the crater's edge. Given the overall lack of impact craters on the Becquerel mound — which hints that, geologically speaking, either it's a comparatively recent feature or it erodes quickly — this group of craters is unusual, not least because they appear to have formed at about the same time. If they did form simultaneously, a couple of possible origins suggest themselves. For one, the craters could been caused by the impact of debris ejected from a larger impact elsewhere on Mars. Impacts throw large clumps of shattered rock for dozens or hundreds of kilometers and perhaps farther. The clumps fly on ballistic arcs, but hit the surface more or less as a group. The result would be a close-spaced cluster of new "secondary" impact craters. Another possible origin plays a variation on this. Recall that Mars orbits next to the asteroid belt. If two asteroids collide in the right way, pieces of flying debris could impact Mars in a group, making much the same sort of shotgun pattern as secondaries from a primary Martian impact. Can scientists say what happened here? Unfortunately, not until they can send sophisticated robotic instruments — or astronauts — to study the crater group in much greater detail. For now, the mound in Becquerel Crater, like other mounds and sheets of sediments across Arabia, holds more mysteries than answers. The layers on the mound's north side are each just a few meters thick, built from sheets of light-toned material, perhaps wind-blown debris or even lake sediments. On top of these, dark basaltic sand has collected in places, helping to make the layers more visible. (Dark dunes have collected in a few places at the foot of the mound.) This image is from the HiRISE camera on Mars Reconnaissance Orbiter. Rising about a hundred meters (330 feet) above the mound, a butte (bottom left) preserves a fragmentary record of sedimentary layers that, elsewhere, have been eroded from all over the mound. A thin line marking a geological fault runs from the right side of the butte toward the mesa at upper right. This image is from the HiRISE camera on Mars Reconnaissance Orbiter.